The unveiling of a monument to Prince Vladimir of Kiev, who brought Christianity to Kievan Rus, in Moscow has caused a painful reaction in Kiev, which has accused Russia of a "hybrid appropriation" of Ukrainian history. Moscow points out that Vladimir brings people together with the help of Orthodoxy. 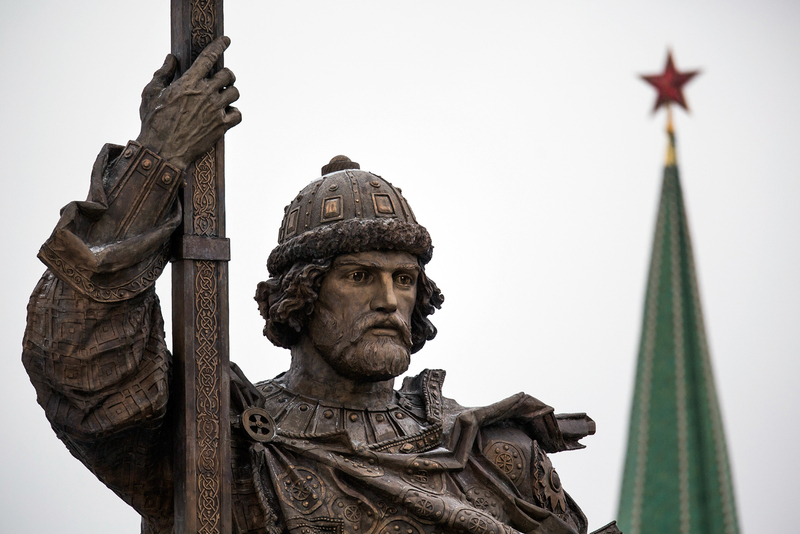 Ukrainian President Petro Poroshenko has responded to the erection in Moscow of a monument to Prince Vladimir (Volodymyr in Ukrainian), the man who brought Christianity to the medieval Russian state, by claiming that Russia is indulging in historical revisionism. "In these days, yet another monument has been opened: In the Kremlin, near the unburied Vladimir Lenin, they unveiled a monument to our equal-to-the-apostles Prince of Kyiv Volodymyr. This is yet another attempt of a hybrid appropriation of history," said Poroshenko on Nov. 8 following the emergence of the 24-meter monument to the prince in the Russian capital. The monument to Prince Vladimir on Borovitskaya Square in Moscow, near the Kremlin, was unveiled on Nov. 4 in an official ceremony attended by senior officials and representatives of the Russian Orthodox Church. Unveiling the monument, Russian President Vladimir Putin said that "this choice [Orthodoxy] has become a common spiritual source for the peoples of Russia, Belarus and Ukraine." According to Putin, Prince Vladimir is a particularly revered saint, statesman and warrior, as well as the spiritual founder of the Russian state. The emotional reaction of the Ukrainian authorities to the installation of the monument to Vladimir followed within a few hours after the ceremony in Moscow. Ukraine's official Twitter-account published a photo of another monument to Vladimir – the Kiev one – and a message in English: "Don't forget what the real Prince Volodymyr monument looks like. Kyiv brought Orthodox Christianity to the [sic] Rus. Kind reminder to @Russia." The Kiev monument to the prince was erected during the time of the Russian Empire – in 1853. Russia's reaction was not too long in coming. "Kind reminder to @Ukraine: Prince Vladimir/Volodymir united our people through Orthodoxy while you're abusing it by spreading hatred among us," said a message which soon appeared on Russia's official Twitter account. The position of the Ukrainian authorities in these historical disputes is based on the fact that Vladimir was a prince of Kiev, and as such is directly related to Ukraine – "our" Ukrainian prince, as Poroshenko said. Moreover, for nearly two years now, he has been considered to be the "creator of the medieval European state of Rus-Ukraine." In February 2015, Poroshenko signed a decree on honoring the memory of the prince in that capacity. At the same time, it is known that the word "Ukraine" as a geographical concept was first mentioned in chronicles in 1187 – more than a half century after the death of the prince. "It was not only a cultural or political choice, but a European choice. All of Europe was already Christian […]," the President of Ukraine said. For the Ukrainian authorities, the fact that Vladimir reigned in Kiev means, in addition to his belonging to Ukraine, that the prince has nothing to do with Russia. According to Kiev, Russian statehood began with the Golden Horde, the mighty medieval empire of the Mongols. The principality of Great Vladimir, which rose among the other Russian principalities after the decline of Kiev in the mid-12th century, was a Mongol vassal state for several centuries, along with the young Muscovite state, which was gaining in strength. The Russian side in this historic debate, in turn, places the emphasis on state succession. The Vladimir and Muscovite principalities were able to preserve this, eventually creating the centralized Russian state with its capital in Moscow. Meanwhile, Kiev lost its statehood for many centuries. An independent state on Ukrainian soil did not emerge again until 1991. The political and historical battles over the new monument were not limited to statements of officials, but predictably spread to social networks. Those who supported Poroshenko emphasized that the prince of Kiev’s ties to the current capital of Russia were tenuous at best. "What does Prince Vladimir have to do with Moscow?" wondered Facebook user Mikhail V. Petrov. Is the Kremlin the right place for Prince Vladimir? He also cited another popular argument of supporters of Rus-Ukraine: The coat of arms of Vladimir depicted a trident, which is the modern emblem of Ukraine. Those who do not agree with the Ukrainian president, like, for example, Facebook user Valentyna Volkova, point out that Vladimir called himself Prince of All Russia, not mentioning Ukraine, which is a more recent term. Others, like Alex Korobov, said that originally Vladimir was a prince in Novgorod (which is difficult to somehow connect with present-day Ukraine), and only later ruled in Kiev. However, some chose to adopt a more humorous interpretation – Facebook user Andrei Lukachev made a tongue-in-cheek comment to the effect that the statue of Vladimir had completed a Moscow trio along with Russian President Vladimir Putin and founder of the USSR Vladimir Lenin. "As the saying goes, we now have a lying Vladimir, a sitting Vladimir and a standing Vladimir in the center of Moscow! Like it or not, but Vladimir is the fate of Russia," wrote Lukachev. Prince Vladimir is honored by the Russian Orthodox Church as a saint and described as equal to the apostles for his special efforts in spreading the Christian faith. The prince, who ruled at the end of the 10th century in Kiev, and before that in Novgorod, is widely revered in Russia. During his reign, the ancient Russian state, Kievan Rus, significantly strengthened, expanded and adopted Byzantine Christianity as the state religion.